Baumgartner Fine Art Restoration has some lovely narrated videos about the restoration process, and an interesting Instagram feed as well. This is really fascinating. I often wish I had been exposed to the restoration field back in college. I just may have gone down that path instead. Coincidentally I just watched this video before I checked MetaFilter, in which a hobbyist restores an old Matchbox toy ambulance. Very relaxing, especially since it's more in the realm of possible for us ordinary people. This is so soothing. I nearly cried when I saw him take all the dust and grime off of the Reginald Marsh painting--to see the brightness of the colors that had been lost for so many years was so emotional. The portrait of the side-burned gentleman did nothing for me as a work of art--it undoubtedly means much to the folks who own it, and they're not wrong and I'm not right--but the Marsh painting is a genuinely interesting piece and it's astonishing how much "age" is all over it. 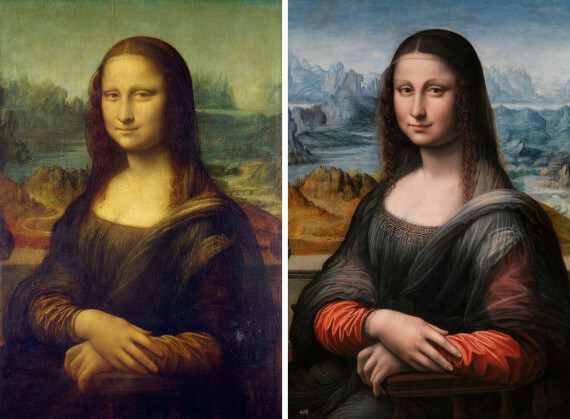 It's like the comparison between the Mona Lisa and a sister piece. The price tag on the Marsh painting said $40. Hey current owner: I am willing to help you out by buying it for triple that, I won't even try to haggle. And I'll throw in a fin for the restoration work. Memail's in my profile.